Fast-forward 20 years and Gopaul still loves the field of biomedical engineering; in fact he even went back to school to complete a post-graduate degree in biomedical engineering at Keele University. “My work impacts the amazing care we offer our patients,” he says. 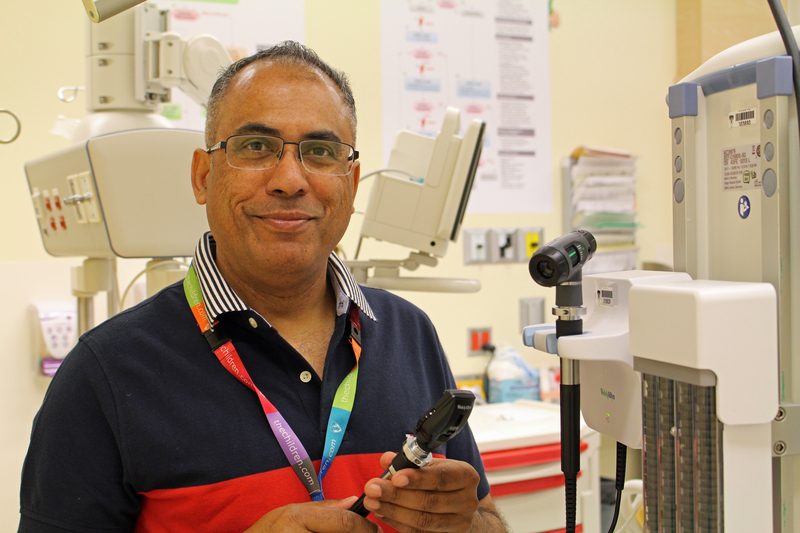 “I get to be part of something very special.” Based at the Glen site, Gopaul’s work involves replacing and buying new pieces of equipment for the Montreal Children’s Hospital. “I work on different projects every day for the hospital and the Children’s Foundation, like doing research for the procurement of new medical equipment,” he says. On average, the MUHC orders approximately 5,000 new pieces of equipment every year. “On a daily basis, seven new pieces of equipment come through our doors at the Glen,” Gopaul says. Technicians, also known as bench workers, maintain, repair, and calibrate the medical equipment. Mobile pieces of equipment are wheeled down to their office space for repairs, while non-mobile fixtures, such as a microscope mounted to a ceiling, are fixed on-site. Each technician is assigned to a different area of the hospital. Some work for specific specialties, while others are assigned to support entire departments. If something cannot be repaired or is beyond economical repair, the technicians will advise the END user to fill out an equipment request form for replacement. In other cases, if a product can be repaired but is beyond their expertise, it goes back to the manufacturer.